It feels weird to write an entry that's not alphabetical. I've become very accustomed to seeing that banner at the top of my entries. Those twenty-six days really wore a groove into my blog that I became pretty comfortable with, despite how demanding the whole thing was. I'm glad to have seen it through, though. One last reminder, I'll be posting an A to Z "reflections" post on Monday to tie a bow on it. In the mean time, we make our way back to normalcy. 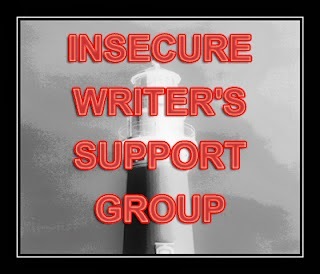 And since today is the first Wednesday of the month, that means it's time for drum circles and group hugs in the Insecure Writer's Support Group, which is hosted by Ninja Overlord Alex J. Cavanaugh. My first post for IWSG was a self-pity party, so this entry's going to be more on the encouraging side. After an April that saw me devoting more and more time to my blog and less time than normal to my writing, I can't wait to kick it into high gear now that I can return to my normal schedule. I was still submitting stories to fiction markets, so it still felt like I was working all month, but it was more than a little frustrating not to see the number of stories currently in submission rise any higher than when the month began. Now, I feel like a sprinter poised and waiting for the gunshot. And honestly, I don't think I've felt this excited to write fiction since last year, when I made the switch from working on a novel to writing short stories. In hindsight, it feels nice to have distracted myself with something time consuming. It was like taking a break without sacrificing productivity. I have that itch to fill the creative void that's been left by a month of daily blogging, but there's very little of the guilt that usually comes from taking a lazy vacation or something along those lines. So to the other insecure writers out there, I say: try it. The next time you feel the onset of burnout creeping in, don't just take a break between projects. Don't just relegate your writing time to television or video games for a while. Fill that time with something productive and rewarding, something you never thought you'd enjoy doing otherwise, preferably (and I think this is key) something that still involves the act of writing. You might be surprised at the result. Glad to hear that you're looking forward to getting back to writing! Strangely, I finished my WIP during the A-Z challenge - I was inspired lol! Congrats, I don't know how you did it! Thankfully, I 'll have more time to prepare for next year's challenge so I don't find myself needing to devote so much time to it while it's going on. Then again, maybe I'll want another month of distraction by then! I thought after the challenge I wouldn't want to write anything EVER again, I haven't stopped! lol Its good to hear you have been inspired by it too. What was particularly inspiring about it for me is that blogging was never my favorite thing to do. I enjoy it, but nowhere near as much as writing fiction. But I proved to myself that I could stick to the schedule, get it done, and find my wheels turning even faster by the end of it. I found the intensive blogging and commenting during A to Z very invigorating. I've written at my novel throughout April, and I've discovered that writing definitely begets more writing, and feedback from others on anything I come up with (like those blog posts) fuels my drive to write anything else too. Sounds like you enjoy writing short fiction more than novels, and by the short story I've just read (Tanks and Bottles) you've got nothing to be insecure about in that department. Seriously. No worries. You're rocking it. I enjoy writing novels, but there's definitely something special about shorts for me. You get to have that exciting feeling of starting something new, plus the accomplishment of completing a project several times over in the same amount of time it would take you to write one novel. And you never really hit that wall in the middle that so many writers are familiar with. I'll definitely return to novel writing one day soon, but all of my short term goals revolve around short fiction. I filled it in with blogging. Now I'm going to switch that around. Several of you really rock with the short stories, which is impressive. I'm going to be switching it around myself! Good luck to you, Alex. Yep, my 'break' from writing is blogging. Trouble is, I tend to convince myself that blogging is writing and so then I end up taking a break from all writing! That's the danger, isn't it! I have a schedule worked out that allots time for both. Of course, that schedule was smashed to pieces in April! I play the guitar myself, though I've fallen so far out of practice these days that I feel like a beginner again every time I pick it up. Getting back in playing shape is one of my side goals for the next year or two. It's great fun, but can be hard work! I think this is good advice. I always feel super-guilty when playing Mass Effect instead of working on stuff! I definitely can empathize with that one! Mass Effect has taken over my life every time a new one came out. Well, at least blogging isn't technically bad for you! I love this post and absolutely agree with your positive vibe-! I've certainly had my "Screw writing! I'm playing DS!" moments, and the little back-of-my-head voice always kicks at my skull every time I succumb to this. Great way to jump back into your normal routine, JW-- thanks for bringing some inspiration to my day!!! Well, kudos for taking a stand! My poor DS just sits on a shelf and gathers dust these days. Unfortunately though, the machine I do most of my gaming on is the same one I do most of my writing on, so I can't toss it in the closet. Sometimes I wish I could! Glad I could be of service, Randi! I must admit that I still feel bad though when I spent my time blogging or on writer's forums and not working on my WIP. It still all involves the act of writing but it still feels a little like procrastination! I hear you, for sure. But that feeling is a good thing! It means you have the drive you need to finish that WIP and put the right amount of work into it. Even if it also means guilt tripping yourself when you need to put time elsewhere. Thanks, Candylynn! You're right there's no better feeling than the one you get right before starting a project, especially if you've been on a break of sorts. Thanks for stopping by. I really need to start spending more time on writing actual fiction. Last month I had the A-Z Blogging Challenge as a partial excuse (though I'd scheduled my posts), but I need to back into the groove now . . . Thanks, Eagle! I highly recommend it! It feels great to get back into the groove again, paired with a nice sense of accomplishment after making it through the challenge.